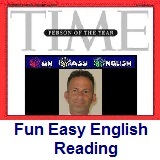 ﻿ Fun Easy English - reading practice and learning about the holiday Groundhog Day. Groundhog Day is a holiday celebrated in the United States and Canada on February 2nd. A groundhog is a rodent and is also known as a woodchuck, marmot, or ground squirrel. Hi. In the classroom today you will learn about Groundhog Day. Groundhog Day is a holiday celebrated in the United States and Canada on February 2nd. A groundhog is a rodent and is also known as a woodchuck, marmot, or ground squirrel. In weather lore, if a groundhog emerges from its burrow on this day and does not see its shadow because the weather is cloudy, winter will soon end. If on the other hand, it is sunny and the groundhog sees its shadow, the groundhog will supposedly retreat into its burrow, and winter will continue for 6 more weeks. Famous groundhogs are found throughout the United States and Canada. The most famous groundhog is Punxsutawney Phil of Punxsutawney, Pennsylvania. As stated earlier, the groundhog's shadow means six more weeks of winter, and no shadow means spring is around the corner. Groundhog Day proponents state that the rodents' forecasts are accurate 75 to 90 percent of the time. A Canadian study for 13 cities in the past 30 to 40 years puts the overall predictions accuracy rate at 37 percent. The National Climatic Data Center puts the overall predictions accuracy rate at around 39 percent. Whether accurate or not, Groundhog Day is still a fun holiday. This is kind of a fun holiday. All across America and Canada, people watch their televisions to see what the groundhog will predict. Groundhog Day - A 1993 comedy film starring Bill Murray and Andie MacDowell. In the film, Murray plays Phil Connors, an egocentric Pittsburgh TV weatherman who, during a hated assignment covering the annual Groundhog Day event (February 2) in Punxsutawney, Pennsylvania finds himself repeating the same day over and over again. The following video was a trailer (preview) for the movie. Try to understand as much of the movie trailer as possible. 1. Groundhog Day is a holiday celebrated in which countries? 2. A groundhog is which of the following? 3. Which of the following is not another name for a groundhog? 4. What is supposed to happen if a groundhog does not see its shadow? 5. What is supposed to happen if a groundhog sees its shadow? 6. Which groundhog is considered to be the most famous? 7. Punxsutawney is located in which state? 8. A Canadian study for 13 cities in the past 30 to 40 years puts the overall predictions accuracy rate at which percentage? 9. The National Climatic Data Center puts the overall predictions accuracy rate at around which percentage? 10. Which of the following is true about Groundhog Day?